This magnificent eight-day cycling holiday takes you along unique places in the Netherlands and ends in neighboring Belgium. The route offers a unique package of impressive historic towns, picturesque villages and an unforgettable natural and cultural landscape. The route is varied and offers something for everyone. You will learn about unique historical cities such as Amsterdam, Gouda, Dordrecht and Middelburg, where the charm of a bygone era is felt in every corner. Nature knows the route in abundance. You will also cycle through the Green Heart. This green area is uniquely situated in the largest metropolitan area of the Netherlands and guarantees an endless feeling of peace and freedom. Nature, characterized by rivers, streams, lakes and islands in the Biesbosch National Park is very different from the Green Heart, but is just as impressive. The water and rich dune landscape of Zeeland is impressive. 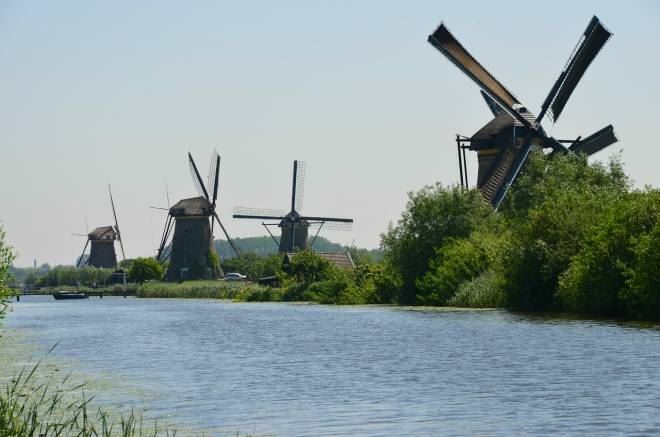 You will cycle along the famous mill complex called the Kinderdijk. These nineteen typical Dutch windmills annually attract millions of tourists. The characteristics of the Zeeland towns and villages are just as beautiful. 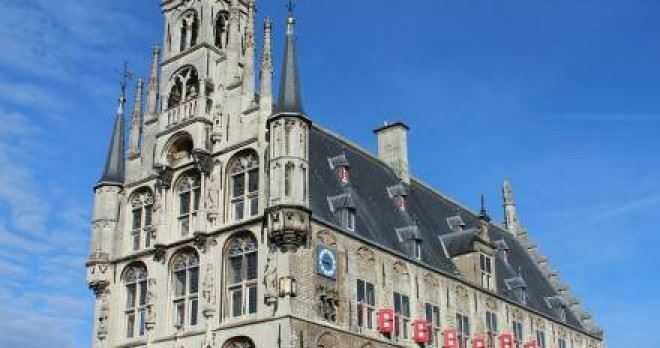 The tour ends in the Belgian town of Bruges, a beautiful city that is also known as “The Pearl of Flanders”. You can start in Amsterdam or in Bruges. Both tours have the same prices and features. You will probably find your answer on this page. 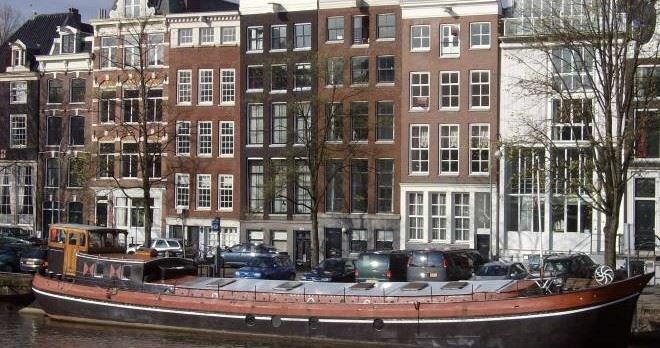 Your cycling holiday begins in Amsterdam, according to many the jewel of Europe. With so much entertainment and attractions, a more vibrant start of your cycling is almost inconceivable. 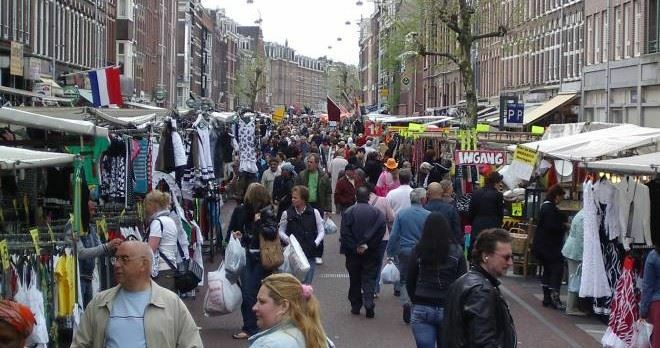 If you arrive on time in Amsterdam, make a stroll through the quaint town center. 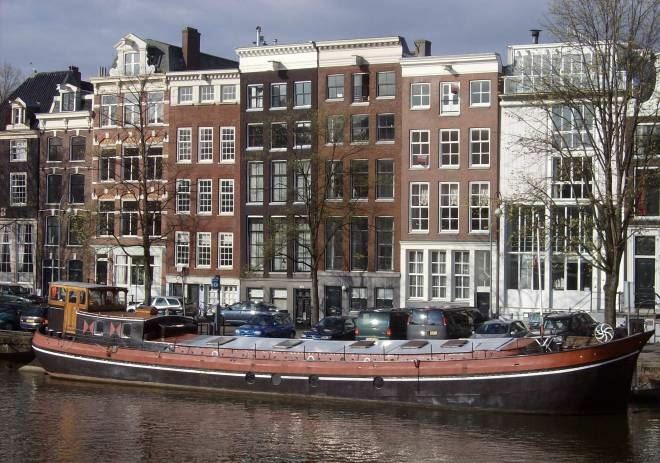 Just watch the characteristic mansions and magnificent seventeenth-century canals (UNESCO status). Do you have time and energy? 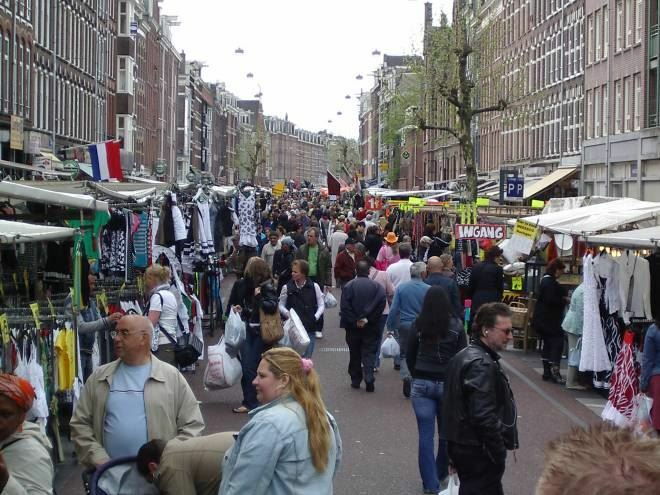 Then walk on through the renowned "red light” district that attracts millions of tourists annually, or admire the Rembrandt Square. In the middle of Dutch largest metropolitan area is a unique piece of nature: the Green Heart. The area is a pleasant contrast. You will see the many faces of this unique area: polders, bogs, water and beautiful historic towns adorn the landscape. 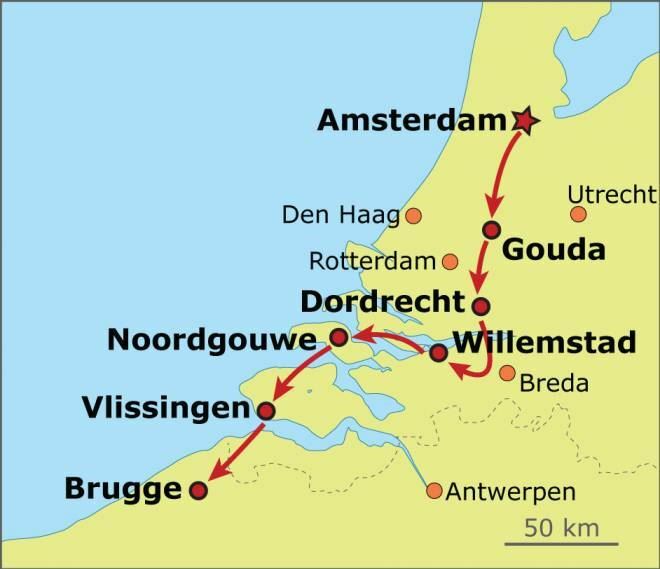 The tour will continue to the city of Gouda that is known throughout the world for its Gouda cheese. Except for cheese, Gouda is also known for its waffles and candles. Make a early evening stroll along the beautiful canals and impressive old buildings. 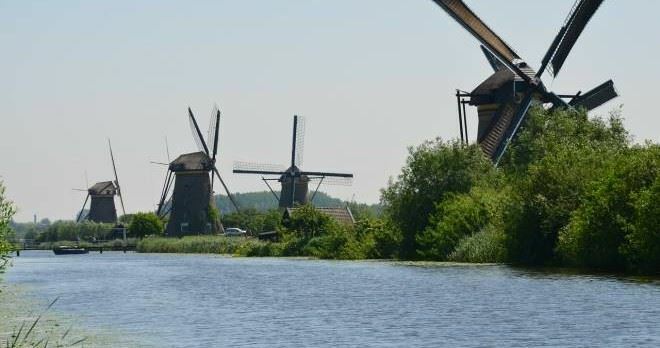 Today you can admire one of “Hollands” most popular tourist attractions: mill complex Kinderdijk. These nineteen typical Dutch windmills built in the 16th century adorn into an equally typical Dutch landscape and are a true Dutch icon. Did you always wanted to know how to become a miller? You can learn it here. Also discover how an authentic windmill works, visit the mill shop and look at how a mill is built. You spend the night in Dordrecht, one of the oldest Dutch cities. Place a vist to the port district with its many historic buildings! Today you will cycle through one of the largest Dutch national parks: De Biesbosch. This largely untouched nature reserve park, which is rich in rivers, streams, lakes and islands, is one of Europe's few freshwater tidal areas with tides. The tour will continue to Willemstad, an old fortified town at the Haringvliet. 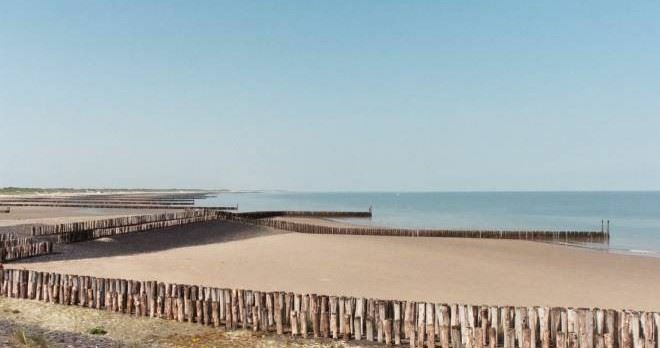 Today you will enjoy a mosaic landscape of polders, rolling dunes and golden sand plates. Via the bridge over the Grevelingenmeer, the largest salt water lake in Western Europe, you reach the island of Schouwen-Duiveland. 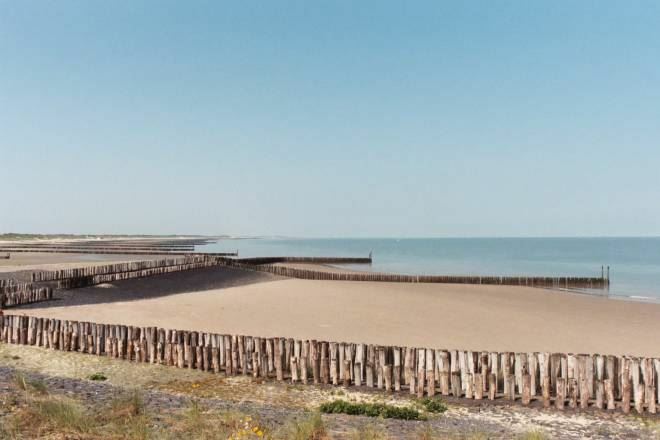 Schouwen-Duiveland is also called the jewel of Zeeland. 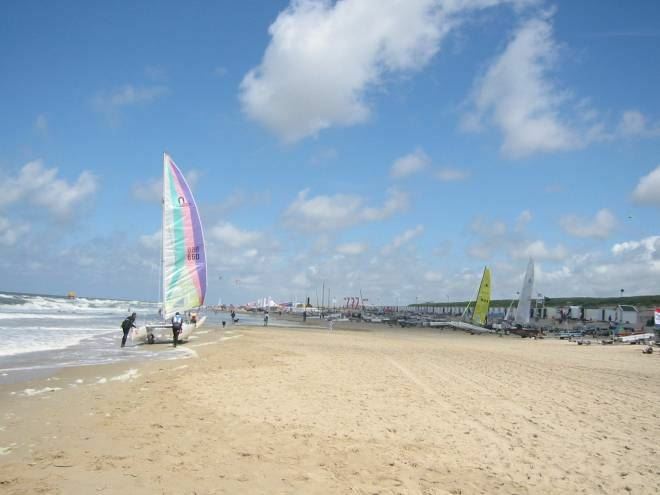 The impressive landscape is rich in hilly dunes, pristine beaches and beautiful forests. In the rural Schuddebeurs you spend the night in a charming hotel. 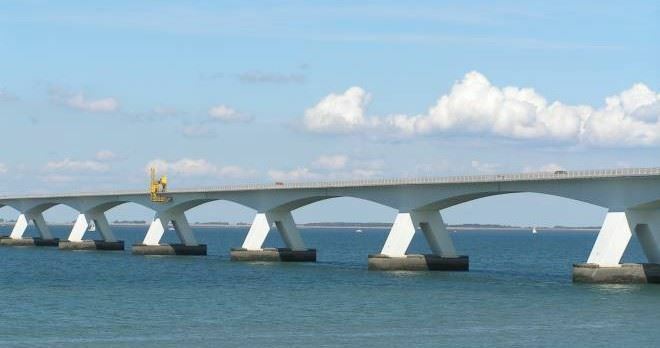 Your day starts with an interesting piece of architecture: the Zeeland Bridge. This bridge was once the longest bridge in Europe and is adorned with no less than fifty arches. 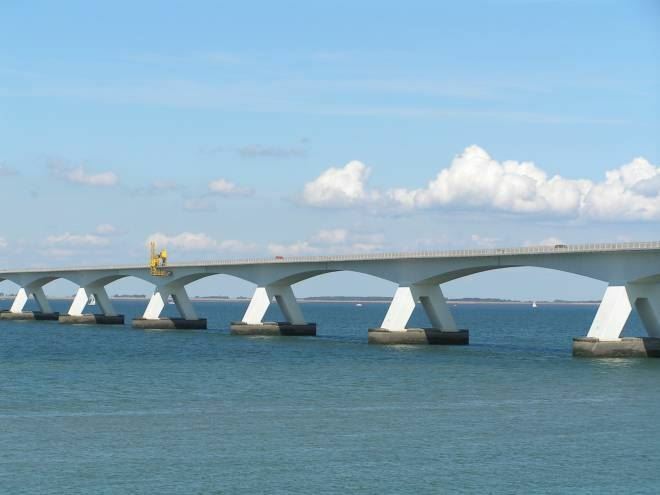 With stunning views of the Oosterschelde you'll cycle via The Zeeland Bridge to North Beveland, the second smallest island of the province of Zeeland. 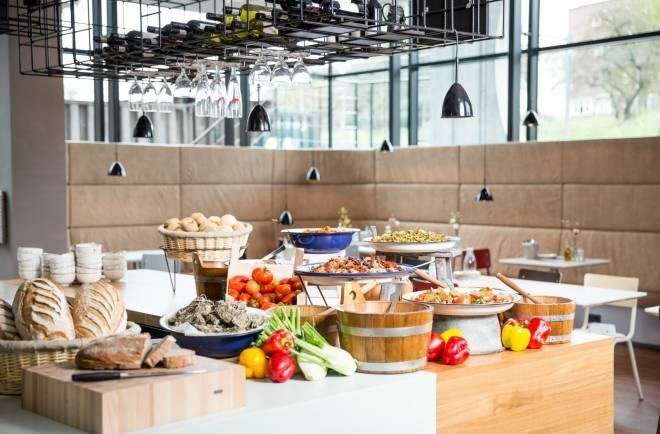 You continue your route through the charming town of Veere to Middelburg. Middelburg, the capital of Zeeland, is one of the oldest Dutch cities. And that is reflected in the many historic buildings that make the city so special. 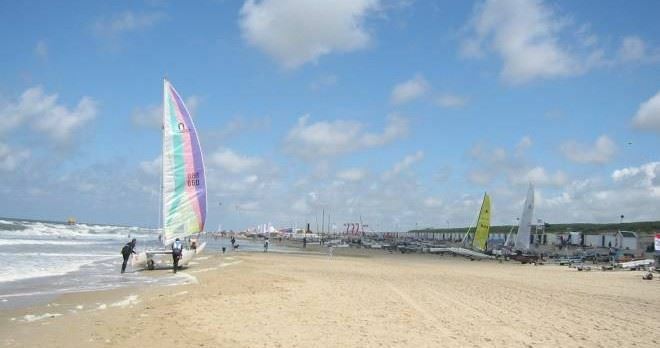 At the end of the day you reach the city of Vlissingen, a harbor city known for its fishing. After a hearty breakfast in Vlissingen you cross by ferry over the Westerschelde. You arrive in southern Flanders with its infinite roads adorned with ancient willows, wet grasslands, Spanish forts and fortifications. Through picturesque villages and hamlets you reach the fortress town of Sluis, situated on the border with Belgium. The tour continues to the charming little town of Damme along the romantic Damme Canal. After that it's only a short bike ride to the historic town Bruges. 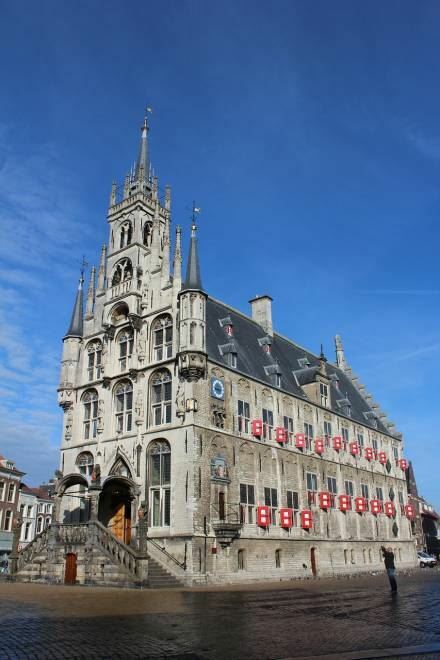 The Belgian city is rich in medieval streets, historic buildings and other attractions. So take some time to visit this impressive city. After breakfast your holiday has come to an end! Hope you had a great time in Holland and Belgium!